This report describes a one-day workshop that presented new downscaled seasonal climate forecasts and a brief training program on how to understand, communicate and use new format with farmer groups. It builds on and extends the previous PICSA training workshops by (a) shifting from the use of station rainfall data to merged gridded data, and (b) introducing experimental seasonal forecasts presented as shifted probability distributions. The workshop began with an introduction to downscaled forecasts in probability-of-exceedance format, and discussion of plans to make these forecasts available through the Meteo-Rwanda maprooms. Key concepts were explained, and their equivalent terms in Kinyarwanda were discussed. Participants were led through an interactive process of eliciting collective memory of rainfall in recent years, developing a time-series graph based on the past 5 years of rainfall data, and then sorting the time series into a probability-of-exceedance graph. Instruction and a breakout group exercise taught participants to interpret probability-of-exceedance graphs. A discussion about El Niño was used to introduce the concept of a seasonal forecast, build confidence that there is a physical basis for seasonal forecasting, reinforce the probabilistic nature of seasonal forecast, and prepare participants to accept the new seasonal forecast format. Showing a probability-of-exceedance graph for El Niño against the probability-of-exceedance for all years is the final step to preparing intermediaries, or the farmers they serve, to understand the new seasonal forecast format. Downscaled forecasts of September-December 2016 total rainfall showed a weak to moderate probability shift towards dryer conditions. The presentation of the current forecast was followed by a discussion of the approach that was presented in the workshop, how the forecast system performs, and how to present the historical and forecast information to farmers. The workshop ended with discussion of action plans for using the new forecasts for project communication and planning activities in the four target districts. Hansen J, Kagabo DM, 2016. 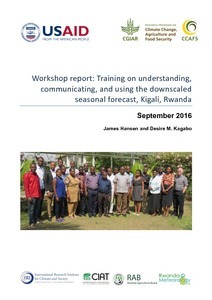 Training on understanding, communicating and using the downscaled seasonal forecast. CCAFS Workshop Report. Copenhagen, Denmark: CGIAR Research Program on Climate Change, Agriculture and Food Security (CCAFS).